When it comes advanced cosmetic dentistry treatments, porcelain veneers are an excellent smile makeover option. Dentists can use porcelain veneers to get rid of chips and cracks, mask major stains and discoloration, conceal crooked teeth and tooth misalignment issues, and improve overall smile aesthetics. They are versatile solutions for many different problems. We place many porcelain veneers here at our Redwood City cosmetic dentistry center. Patients are quite pleased with the results, and the veneers themselves will last for quite some time. Of course, the veneers will eventually need to be replaced. Let's explore this aspect of porcelain veneers treatment right now. In general, porcelain veneers last about 10 years. With very good care, a patient can make their porcelain veneers last up to 15 years. However, after a certain amount of time, the porcelain veneers will need to be replaced. The most common cause of damage to porcelain veneers is the natural wear and tear sustained on a daily basis. Like you natural teeth, biting and chewing will take their toll on your teeth, which means that restorative care may be necessary later on down the road. Veneers will wear away even if you are diligent about brushing, flossing, and proper oral hygiene. Tooth Decay Around the Porcelain Veneer – If a tooth with a porcelain veneer is eroding or decaying, the veneer will need to be removed in order to restore the tooth structure. Damage from Teeth Grinding (Bruxism) – If you grind or clench your teeth at night, this can cause serious damage to your natural tooth structure as well as your porcelain veneers. Oral Injuries That Fracture Teeth – Sports injuries, vehicle accidents, slips, falls, and other kinds of physical injuries can lead to chipped, cracked, or damaged veneers. The process for replacing a porcelain veneer is just like the process for initially placing your porcelain veneer. The old veneer is removed and the underlying tooth structure is carefully prepped. An impression is taken of the tooth from which the new porcelain veneer will be crafted. A dental lab creates the new veneer, which will be placed at a future visit. 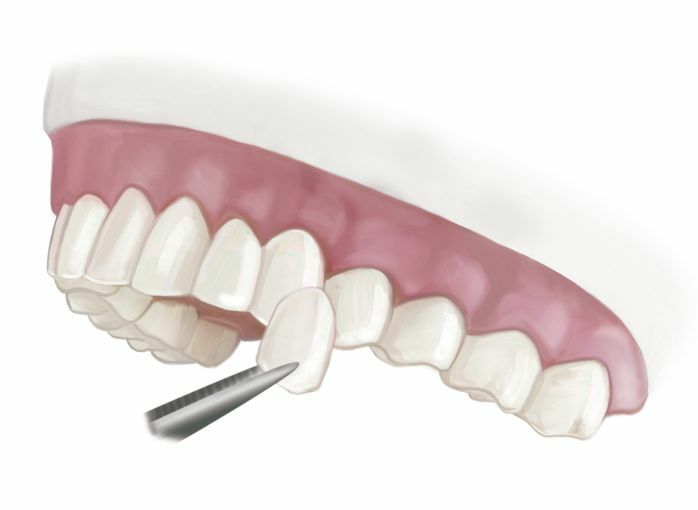 In the interim, temporary veneers are worn. To prolong the life of your porcelain veneers, it's important to brush and floss regularly. It's also important that you wear mouth and face protection while playing sports, and that you be cautious in any other situations in which you may experience injury to the mouth. Regular dental checkups can help manage minor dental problems before they become more serious, which including addressing issues that may involve your veneers. If you would like more information about porcelain veneers and how they can help you have a beautiful smile, be sure to contact our cosmetic and restorative dentistry center today. The team at our practice wants to make you smile look its very best.